Watching Chris Sharma in finals! It might have been the most incredible climbing weekend of my life. And not because of how I climbed, but because of how it made me feel. I'm sitting here back in Philly on a rainy, cold, miserable Monday and I can still feel the endorphins coursing through my veins, a byproduct of the awe and inspiration I left Maryland with on Saturday night. And I'm going to hang on to that feeling as long as possible. 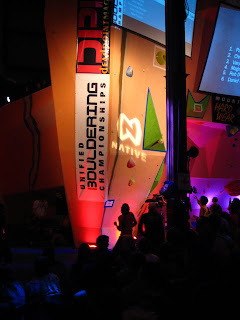 The Earth Treks Roc Comp, sponsored by Mountain Hardwear, is the third bouldering competition I've done, and by far both the most difficult and rewarding. The Earth Treks team did an incredible job putting the whole thing together and making the problems challenging and interesting. Even the easier 100-point problems made me think! 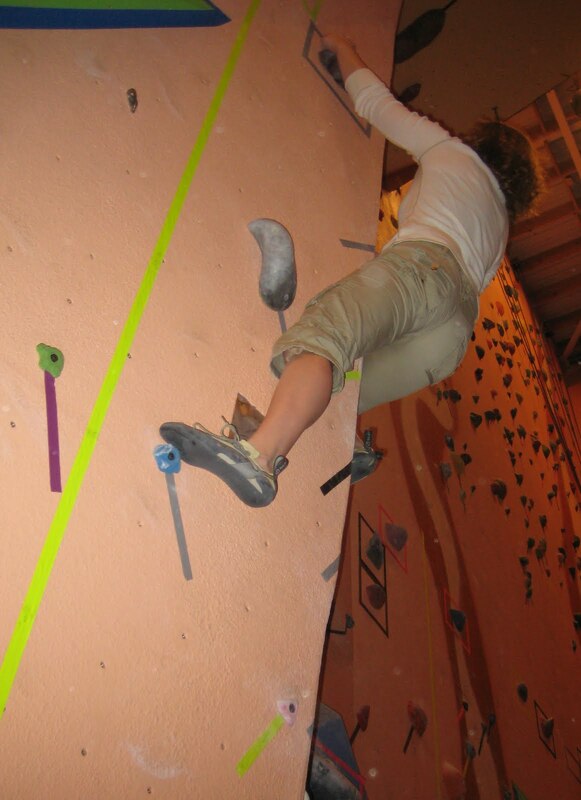 The problems were tough, the competition stiff, and the sheer number of hours spent climbing wonderfully exhausting. Climbing started at 4pm on Friday at Earth Treks Columbia, and went until 10pm. 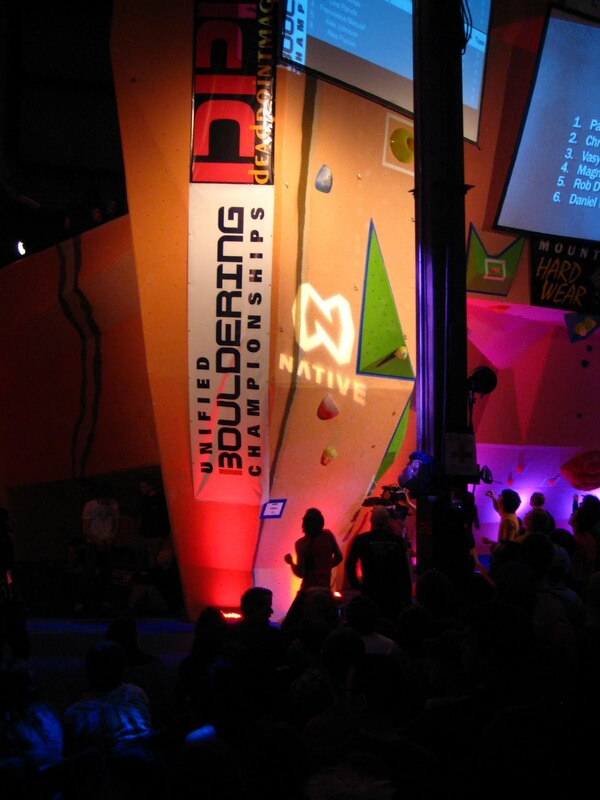 It was the typical redpoint format competition with each section monitored by a judge. There was no bonus for flashing, and each fall meant subtracting a point from your score. I'd gone down with Paul, a friend from Go Vertical, and we warmed up on easier problems before picking the ones we'd spend the evening working on. I was definitely nervous and jittery the entire day. As usual, I put an incredible amount of pressure on myself. The more nervous I got, the more frequently I fell. But after I'd figured out how to calm myself down a bit, things went great. I finished a few 500 point problems, attempted and was close to finishing a 600-pointer, and ended up with 2539 points. My score was good enough for 20th out of 35 in Women's Intermediate, and 28th out of 66 overall in the Citizens Comp. It was a respectable day, and a day I was proud of. I definitely posted a problem or two on the scorecard I didn't think I had a prayer of finishing. It's amazing what support from a group of strangers and a little pressure can do! Knowing you'll have to go to the back of the line and wait 15 minutes to try it again if you fall helps too. Paul had an amazing showing with 3257 points and a 22nd place finish in Men's Intermediate. 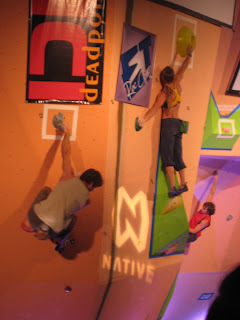 A fellow Philly climber, Andrew Egan, won the Men's Advanced division with 4426 points. The coolest moment of the day was sitting side by side waiting for my turn on a section right behind Lisa Rands. She was attempting a 915-point problem while I waited for another try on a 565-pointer. 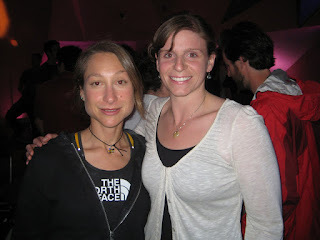 I'd kept my eye out for her, Chris Sharma, Matt Bosley, Alex Puccio, Daniel Woods and all the other pros during the course of the day, and it was so incredibly inspiring climbing with them there. Seeing Lisa Rands in particular left me a little starstruck! She's been one of my idols since I discovered my love for bouldering, and the chance to be in the same line with her waiting to climb was amazing. Of course, seeing Chris Sharma in person seemed surreal, especially when he flashed the hardest problem at the comp. I'd try explaining the significance of climbing with Lisa and Chris to non-climbers by comparing it to playing basketball with Michael Jordan, but I'm not even sure that was enough! This was the day I'd been waiting for since I'd found out about the Roc Comp - a chance to see some of the best climbers in the country compete in person! Paul and I started the day the best way we could think of - we headed straight back to the Earth Treks Columbia to conquer some of the problems that alluded us the day before! My favorite project of the day was a 500-pointer featuring a large hold that resembled Jason Kehl's "The Growth." We logged another two and a half hours of climbing before deciding our bodies couldn't take any more, and drove up to Earth Treks Timonium to watch the Citizens Comp Semifinals. I don't think my fingertips have ever been that raw! It felt so incredibly good. And it was hard to stop climbing, it almost hurt. The Citizens Comp Semifinals was essentially a qualifier for Pro Finals. The top 20 competitors in the pro category made it to semifinals, and the top six in semifinals competed again in finals. Semifinals consisted of four problems, and finals included three. I couldn't have finished, potentially started, any of them! 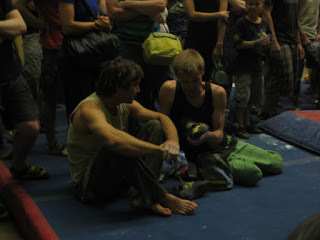 Paul and I watched the semifinals while another car full of Philly climbers made their way south to meet us for finals. The semifinals field was incredibly competitive, and climbers I expected to qualify for finals didn't. The Pro Finals were beyond incredible. The gym was packed to the brim with spectators and deafening cheers erupted from the crowd at regular intervals. It was unlike anything I'd ever seen before, and I'm sure whatever words I choose in this post won't begin to describe what I was feeling watching all of it! All I can say is I'm convinced each one of the finals climbers has superpowers. Watching them hit moves I didn't think were humanly possible has me absolutely positive each of them is a super-person. After it was over, I was determined to gather up enough courage to meet Lisa Rands after having spent quite a bit of the weekend trying to figure out what you're supposed to say when you walk up to one of your idols to introduce yourself. I discovered even if you plan what you'd like to say, it goes out the window when you realize they're right in front of you, ready to talk to you like any normal person would! Meeting Lisa was the highlight of my weekend, and despite feeling like a silly crazy person being so worked up about saying hello to her, I'm glad I had the chance to do it. I had to remind myself that despite her living legend status, we both share a passion for the same thing, and we have climbing in common. All 300 of us who competed this weekend have something very special in common. We made it back to Philly just after midnight Saturday. I planned to go straight to bed knowing I had to get up to lead a TerraMar Adventures hike in the Delaware Water Gap Sunday morning, but couldn't resist pulling out the camera to check the photos and videos we took. I woke up absolutely exhausted, but still reeling from the excitement of the comp - a happy hangover. 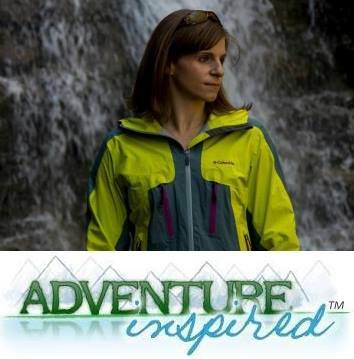 I left Maryland so inspired to climb harder, to push myself beyond what's comfortable, and am going to hang on to that feeling as long as I can. Thanks for writing this! It was a fun to read about some one else's experience this weekend.